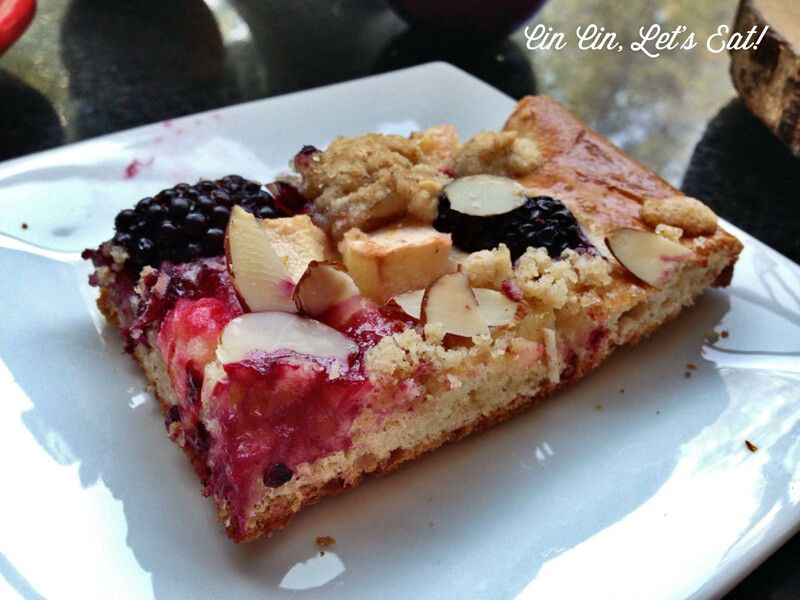 Apple and Blackberry Kuchen [recipe] – Cin Cin, Let's Eat! With the help of the bread baking class I took back in February in New York, I feel a lot more confident handling yeast and kneading dough. 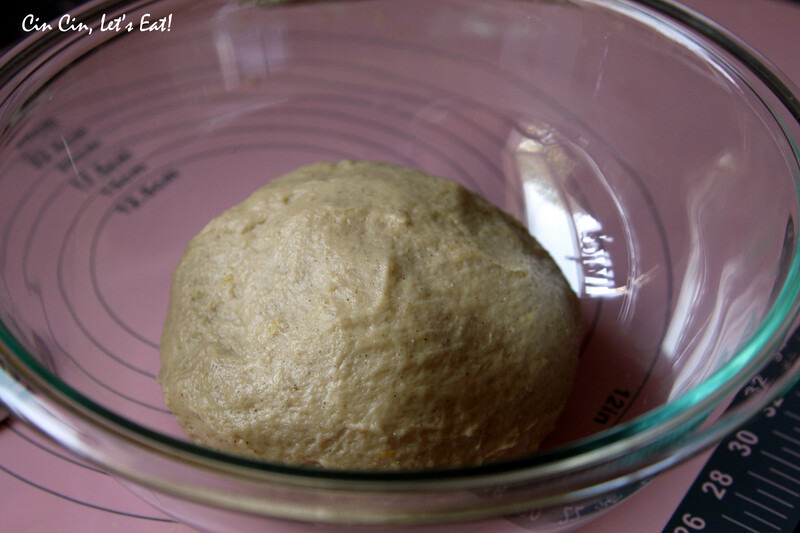 The hardest part for me is still the waiting game, waiting for the dough to proof and rise. Learning the art of being patient through baking has been interesting, lying and persuading myself that the dough “looks” like it has doubled in size and having the dough actually rises and doubles yield two very different result. But I know now what to look for in a perfectly proofed dough, it’s all about the bounciness and how quickly it springs back if you poke at it gently. I came across a rerun episode of Nigella Bites a couple weekends ago. By “rerun”, I meant it was first aired when I just started college, over 10 years ago. I actually remembered watching this breakfast-centric episode back at my parents house. It was a cold winter day and I still remembered learning about what kuchen meant (German cake, usually with sweet yeast dough, fruit and/or custard) and how much this pastry appealed to me, but that seemed like another life time ago and I wasn’t much of an adventurous and ambitious cook back then, let along kneading and working with dough from scratch. A decade later, I’m so happy to see this episode on TV again, except this time I was determined to make and taste it! Good things come to those who wait! 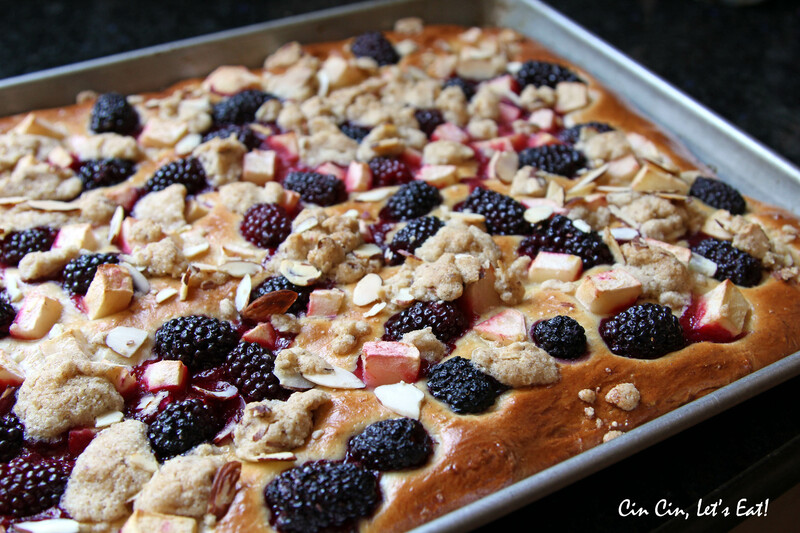 After waiting 2+ hours for the dough to proof plus more time for baking, I took out a tray of beautifully golden brown kuchen with bursting blackberry and crispy crumbly topping. Most of the ingredients for this recipe are items one would most likely already have in their pantry. 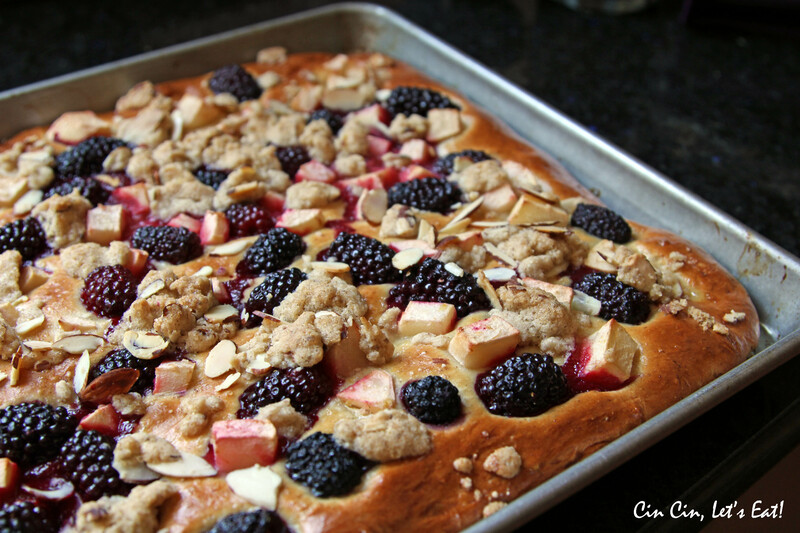 I’d imagine it’d be equally yummy with different seasonal fruits on top. This cake is best served warm. It’s not too sweet so if you have a big sweet tooth, adjust the sugar amount and perhaps serve it with a drizzle of honey. 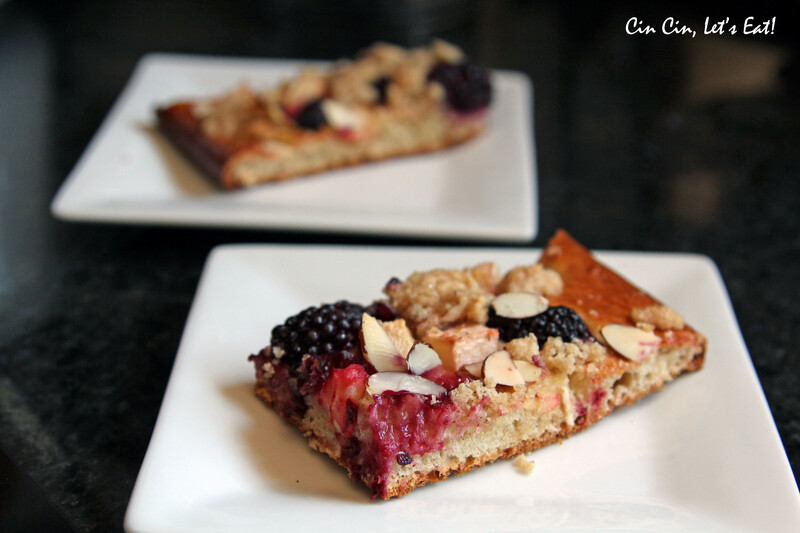 It’s very light so it can easily be served as a breakfast pastry. Refrigerate any uneaten pieces, toast them before eating. After kneading, it looks glossy and velvety. Cover with a kitchen towel and leave until doubled in size (1 hour to 1 hour 15 minutes). Or leave to rise slowly in a cold place overnight. 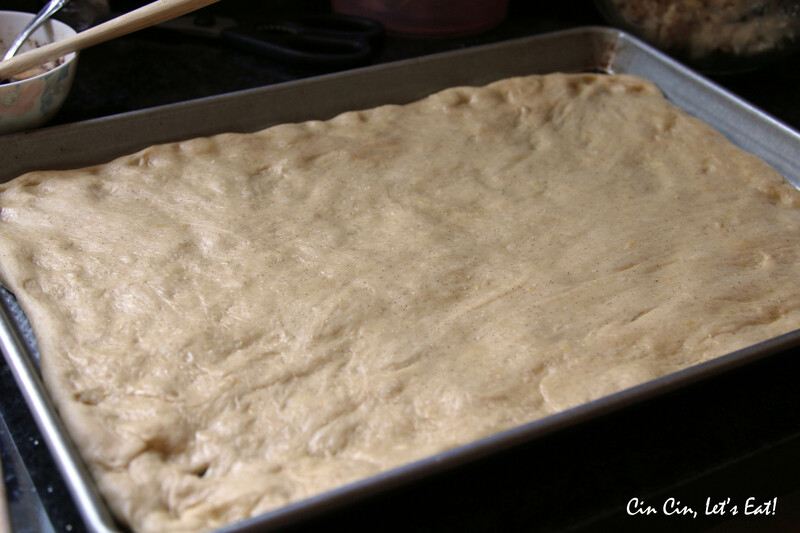 Then punch down and press to line a jellyroll pan measuring 13 by 9-inches. You may think it’s never going to stretch to fit, but it will, although you may need to let it rest for 10 minutes or so mid-stretch, especially if the dough has had a cold rise. 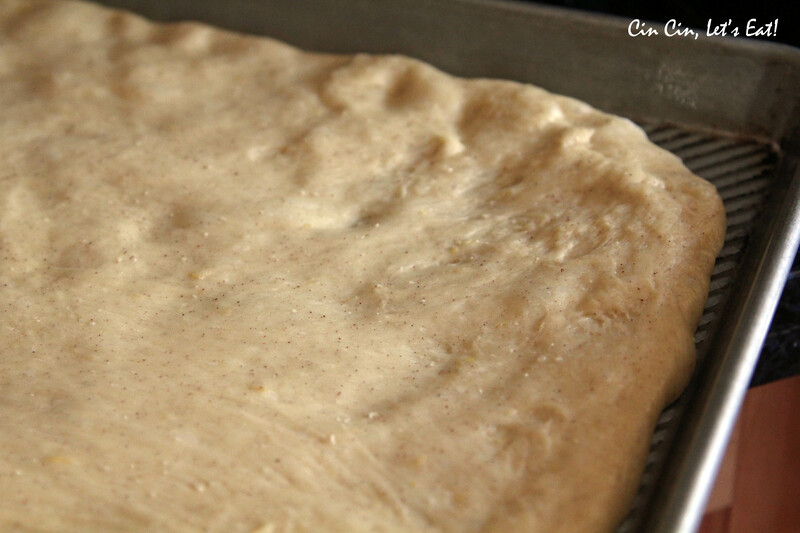 When it’s pressed out on the pan, leave it to rest for 15 to 20 minutes and then brush with the egg and cream mixture. The dough didn’t stretch all the way to fit the pan the first time. After waiting another 15 minutes, I was able to stretch it all the way to meet four sides of the tray. 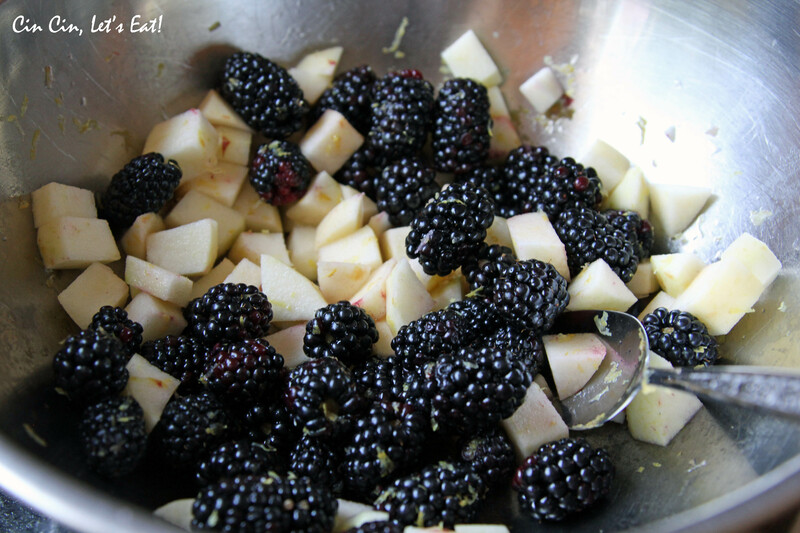 Peel and chop the apple and toss it in a bowl with the blackberries and the zest from the other half lemon. 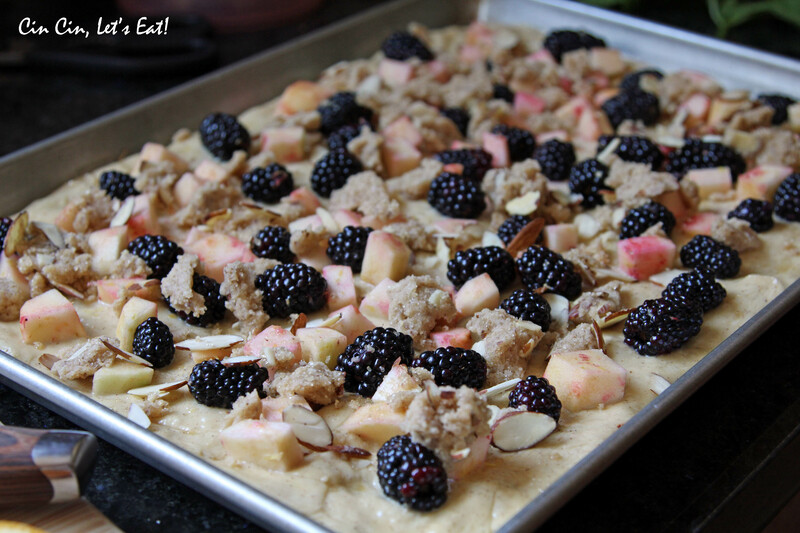 Set the bowl aside for the few minutes it takes to make the crumble topping. 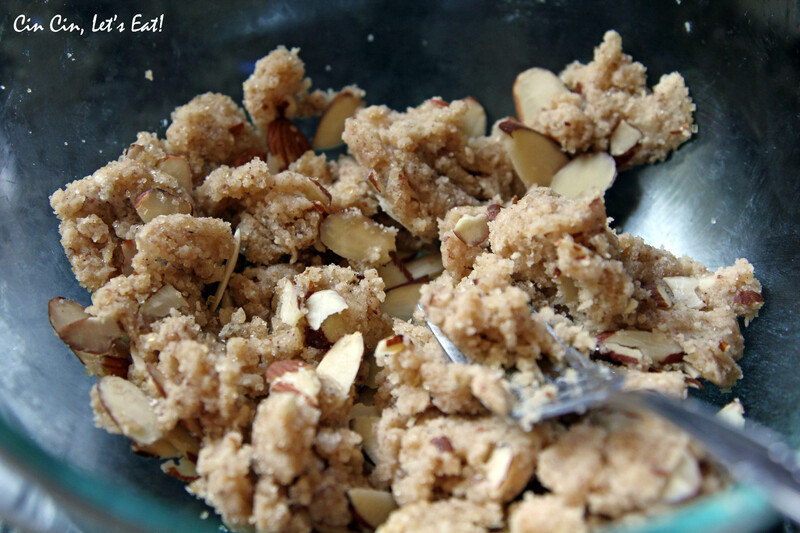 Put the flour, ground almonds and cinnamon in a medium-sized bowl, stir to combine, then add the cold, diced butter. Using the tips of your fingers – index and middle stroking the fleshly pads of your clumpy (this is very buttery mixture) oatmeal. Fork in the sugars and sliced almonds. 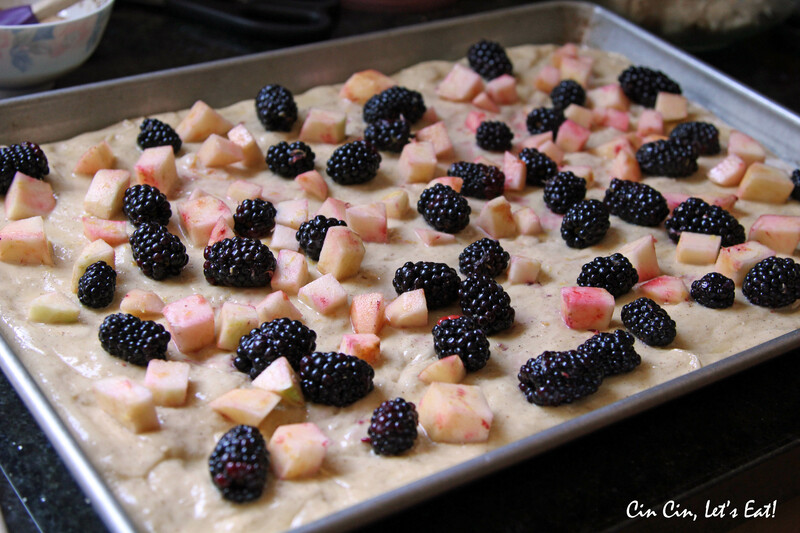 Tumble the fruit over the egg-washed dough and then sprinkle the crumble on top of that. Put in the oven for 15 minutes, then turn down to 350 degrees F and cook for a further 20 minutes or so, until the dough is swelling and golden at its billowing edges and the crumble is set; don’t expect it to be crunchy. This is definitely worth revisiting. Looks fantastic.